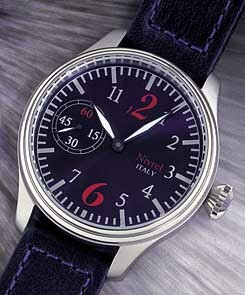 This Nivrel is made in Italy, and is not to be confused with the German company Nivrel. It is housed in a 47mm steel case and features a manual wind Unitas Caliber 6497 with double sapphire crystals. MSRP is 300 Euros.